In this intensive Rio will introduce you to a process she developed in 2008, called Composting. This technique uses harvested plants in combination with rust, immersion dyeing and concentrated extracts to create pattern and colors that speak from the essence of the plant. We will create dye baths with the plants she has collected from harvest and extracts such as cochineal and Osage Orange. Together we will explore the area and collect what we can find as well. These baths will be used to under dye and over dye the work we create. By using the fresh, or dried dyestuffs to directly incorporate into our work samples you will discover various results. 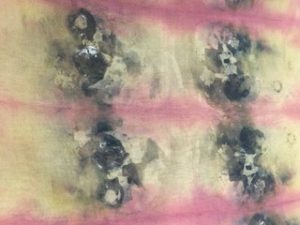 Rio will introduce shibori methods that will be used for creating pattern and we will make several small bundles for samples and eventually larger bundles for a final piece. There will be discussion on harvesting and working with the cycle of the seasons to create work as well as the environmental benefits of working with this process. With a little heat, time and precious plant tissues you will unlock stories of natural color.